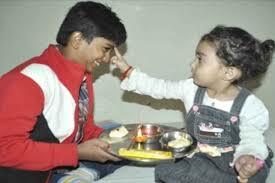 Bhai Dooj, Bhau-beej or Bhaiya Duj is celebrated by Hindus in Benares very happily in the traditional and cultural way. It is generally based on the relationship of the brother and sister, a great festival in Hinduism. People celebrate the festival of Bhai duj on the last day means 5th day of Diwali (the second day of bright fortnight, Shukla Paksha of the Kartika month). At this occasion, all the sisters make a pray to the God for their dear brothers to have long, prosperous and successful life. First they perform the Tika ceremony and then, in returns they get a nice and lovely gift from their brothers. This festival is known as a the symbol of love for all the sisters and brothers. In the Vedic era, the legend of the Bhai duj is the God Yama (Yamraj), also known as the Lord of death. It is believed that, the God Yama was used to visit his sister Yamuna on this day and she kindly welcomed him by making a tilak on his forehead, which is still celebrated as Bhai duj. God Yama had given his sister a Vardan that anyone who see his sister on this day will be free from all his/her sins and got Moksha. From that day, brothers go to see their sisters on this great day for their well-being. That’s why, Bhai Duj is also famous by the name of Yama-Dwitiya. Another myth of the Bhai Duj is, Mahavir (founder of the Jainism), who got nirvana at this day and his brother (King Nandivardhan) was very upset as he neglected him and reassured by his sister (Sudarshana). That’s why sisters are revered by their dear brothers at the Bhai Duj festival. One more myth is, Lord Krishna returned to his home and went to meet his sister Subhadra after killing the demon named, Narakasura. Subhadra welcomed his brother, Lord Krishna, very kindly by making a tilak on his forehead. Hence, this day has became the celebration point of never-ending bond of the love and care between the brothers and sisters. Sisters wake up early in the morning on this day and decorate their Puja Thali, put a vermilion paste as a sacred tika on the brother’s forehead, do arti, then they make pray to the God for the long and successful life of their cherished brothers. In turn, they get nice gift and lot of promises from their brothers to get protected whole life from the bad forces. On this occasion, special gifts are available in the market at very affordable prices. The festival of Bhai Duj is especially devoted to the sisters. It is celebrated by sisters by putting a propitious tilak of a vermilion paste on brother’s forehead and doing arti by diya. It is a symbol of love and security by evil forces to the sisters by brothers. Sisters get beautiful gifts and lot of blessings too by their brothers. Bhai Duj is a festival of brother and sister’s love, sweets, decorations, firecrackers, lights, and barter of the gifts celebrated at the end day of the Diwali festival (a five days long festival, starts from Dhanteras and ends with Bhai Duj). Most common Bhai Duj gifts purchased by the brothers and sisters are puja thali, sweet hamper, gift baskets, jewellery, and many more. 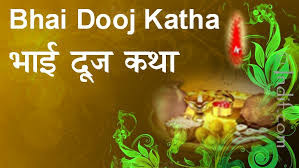 Bhai dooj is different in different states of India with a variety of names in different parts of the country. The rituals vary a little due cultural diversity and similar to Rakhsha Bandhan, Bhai dooj strengthens the bond between and sisters. In this post you will get to know some amazing facts about the festival and difference in rituals in various parts of India. Marathi communities call the festival Bhai Beej. 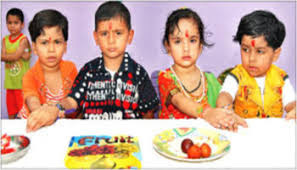 Sister and makes brother sit on square mattress or square shaped platform in it and then they have a bitter fruit named ‘Karith’. After this ritual they apply tilak to their brother and then have traditional sweets like Basundi Puri and Shrikhand Puri are served. Sisters give a piece of cloth knotted into circular shape, full of batashas (Sugar balls) to their brothers. This piece of cloth is call ‘aabf’. For each brother there will be two ‘aabf’ and later after this ritual the sisters apply a tika of roli and rice on the forehead of brothers and perform the traditional aarti. Then the sweets are offered following narration of the story behind ‘Bhai Dooj‘. 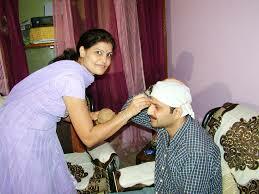 In Gujarat they call it ‘Bhai Beej‘ and the rituals follow tilak, traditional sweets and aarti. Sisters pray for their brothers good fortune and in return the brothers bless them and then they exchange gifts. In Bengal this festival is called ‘Bhai Phota’ and the sisters maintain fast till the time all the rituals are performed. And then they apply tika made up of sandalwood, ghee and kajal. Then they perform aarti and feed sweets to their brothers. Coconut laddus and kheer are the traditional sweets prepared. Bihar celebrates ‘Bhai Dooj’ in a unique way. The sisters curse their brothers to keep the evil spirits away by using all the bad words and then they prick their own tongue with a wild prickly fruit as a punishment. They ask their brothers to forgive them for their mistakes till date and then they feed their brothers with few grains of bajri with water. 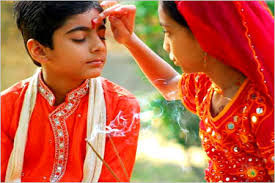 In Punjab the day after Diwali is celebrated as ‘tika’ where the sisters make paste of saffron and rice and apply on their brother’s forehead to keep away all the difficulties and dangers. Later on, they give sweets and exchange gifts. Post your thoughts about the festival in the comment section below!! !